Thanks for posting - that is one superb looking sword. Have you done any cutting with it and if so, how did it perform? No, I have not cut with it. I'm just a collector at this point, maybe someday I'll get into the performance end of the hobby. I love this sword though it feels great in my hand, but i'm no expert. Nice looking Scian, do you have some specs? Length, blade length, blade width, weight etc? What is the hilt made of on the original Scian you posted from Limerick city museum? It doesn't look like wood and it appears to be fused. Lastly do you know if Scian is the correct in period term for these knives? I've also seen it spelt Skean and a few other ways as well. scian, skeen skean, sgian, these are all phonetic spellings in english of the gaelic word for "knife"
Thanks Danny, Its 24.75 overall with a 20 inch blade. Dagger, iron with wooden handle. Triangular single edge blade, the spine a low V cross section. The wooden handle is cylindrical, cut out along the central portion to form a three loop spiral ridge in false relief, a shallow groove along the spine of the ridge. The handle is strengthened at either end with an iron hoop, formerly flush with the surface of the handle. The area between the hoops and the spiral section are ornamented with motifs in false relief formed by cut out triangles and lozenges, a narrow ridge being formed to each side of the ornamented bands. The end of the handle is held in place by a sunken washer over the end of the tang, which is hammered. The wood around the washer is iron impregnated and may have had zig-zag ornament. Centre of gravity 15cm below handle. Conserved. As far as the spelling I defer to my irish friends on Irish Living history who say that the correct term in irish gaelic is scian. On the "skean" thing, you might get more information if you spell it "scian", as that's the modern Irish (Gaelic) spelling (I think skean is scots-gaelic). Check out http://livinghistory.ie/modules.php?name=Foru...ight=scian for instance - it's handy to have a board handy that has Irish archeologists available for questions! yes right. scian is the correct modern spelling. but is used for just about any knife. my grandmother used it to refer to kitchen and table knives, more or less any knife. its not just a term for the long war knife. I forgot but if you are digging through old documents "skeyne" is another very common spelling used in english within period for the long war knife. the term dirk dirke durk durke is also used in late 16th and 17th century by English writers as it is an old scots term for a dagger that the english picked up on. you will also occasionally see the word "flatchet" or "flatchett" or "flatchette" or "flached"used within period, but it is thought that flatchet referred more to a short, broader double edged blade used by many kern, somewhat like a katzbalger in size but with a very simple dagger like hilt. it is confusing at times though because sometimes these "flatchets" were described as having very simple hilts like the long war knives, so the terms can get mixed up by english writers for the two types of blades. despite multiple references to these flatchets, i don't know that we have any surviving examples in Ireland. Recently we had a thread on the leine croich and how inaccurate it is to portray Irish and Scots in kilts for the medieval period. 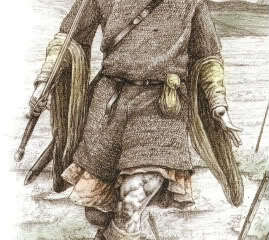 One other thing that I have been having trouble with lately though is the accuracy of many recently published illustrations showing kerne and gallowglass in leines with short sleeved (to the elbow) mail shirts (haubergeons) over them bearing two handed weapons (sparths, axes and longswords) with no forearm defence. First my experience in longsword is that the number one place I get hit when fencing is my forearms, I would imagine that the same would hold true with polearms and a friend of mine who practices quarterstaff agrees. This usually takes the form of mail to the wrist, or the quilted cotun to the wrist, and in some cases (Butler at Jerpoint or the Glinsk effigy) splinted or gutter shaped steel vambraces on the forearms. Or it takes the form shown on the Ashmolean drawing, with an ionar which has full sleeves over the leine. Finally, I just can not get my head around having the wealth to possess a helm and mail shirt and mail pisane collar and a leine made with yards and yards of saffron dyed material and some nice two handed weapons but not have the means to buy or own forearm defence. it just makes no sense to me whatsoever to go into battle dressed in that manner. I am sorry to pick at little details, and certainly I am not trying to be a bother or a critic of certain authors and their recently published works, but I am concerned that this might be another one of those inaccurate memes that has gotten started and is currently gaining momentum. 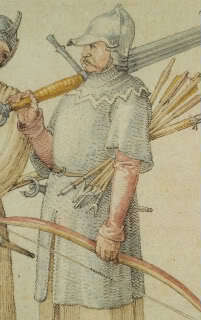 Now having said all of that there is one depiction from 1521 by Durer of the Irishman with the two handed sword and bow who has a helm, mail haubergeon and mail collar but no forearm defence. Ever tried to shoot a bow in fully mailled sleeves? Or heavily quilted ones? That right there might be your answer. ps. In general I am shying away from referencing or pointing people to Derricke's images of Ireland. Although I agree that it is a piece of history worth reviewing, personally I find them offensive propaganda and there are many inaccurate depictions in those drawings, starting with the ionars. I'd wondered about the half length sleeves as well but it seems that there were all sorts of variations - possibly due to the wealth of gallowglass or personal preference. The Osprey Galloglass 1250 - 1600 describes wrist length and elbow length maille and those who just wore cotun. The tomb effigies and illustrations from maps seem to bear out the mix. John Marsden's book seems to have similar variations. My experience in WMA (I have a gallowglass kit that I train in) is similar to Thom's - exposed forearms get hit. I wear maille and plate gauntlets - there does seem to be some justification for the plate part anyway in some images. The pattern I used for my leine was from Reconstructing History, http://www.reconstructinghistory.com/products/rh304-mans-leine-1, and the one I used for my ionar, http://www.reconstructinghistory.com/products...n-outfit-1 . The leine ends at my elbow, even though it looks like it goes to the wrist in their drawing and the ionar covers the rest of my arm. I don't know how accurate the leine pattern is, since a lot of art work looks like the leine goes to the wrist. But I've also seen some leines where the sleeves go to the wrist, but the body ends at mid-thigh. So I'm not so sure how accurate any leine reproduction is. I'm also very interested in the length of leine sleeves. When I practice, I wear leather vambraces since I get hit a lot there as well. 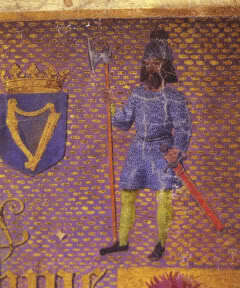 Hey guys, just wondering but does anyone here know where I could find a better quality image of the picture of an Irishman holding a dart by Hieronymus Tielssch posted by Bob Gresh on the first page of this topic. you will also occasionally see the word "flatchet" or "flatchett" or "flatchette" or "flached"used within period, but it is thought that flatchet referred more to a short, broader double edged blade used by many kern, somewhat like a katzbalger in size but with a very simple dagger like hilt. it is confusing at times though because sometimes these "flatchets" were described as having very simple hilts like the long war knives, so the terms can get mixed up by english writers for the two types of blades. despite multiple references to these flatchets, i don't know that we have any surviving examples in Ireland. Thom R. Could you (or anyone else) elaborate on this "fletchet". After reading through this great topic, I tried searching for references but unfortunately I've come up empty handed. Any help would be greatly appreciated.